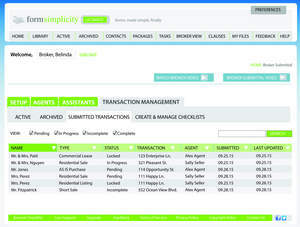 ORLANDO, FL--(Marketwired - Sep 30, 2015) - One of the real estate industry's most popular and advanced paperless transaction solutions, Form Simplicity, has added Broker Transaction Management into its cloud-based platform. Broker Transaction Management creates a single place inside Form Simplicity for real estate brokers to manage, review, approve, track and store every agent's transaction activity from beginning to end. Form Simplicity's new Broker Transaction Management tools allow real estate brokers to reduce their risk through a customizable, automated, paperless review process that helps safeguard brokerage transactions to remain compliant. Brokers may collaborate with agents throughout the transaction review process to ensure accuracy across the streamlined workflow. For office transparency, the new Broker Transaction Management feature also tracks email and text correspondence for every transaction, gives brokers visibility into each agent's transaction activity, and allows brokers to evaluate, comment on and approve all forms digitally submitted by their agents. Eric Forsman, Vice President of Technology Services at Florida Realtors®, says that the development of the Broker Transaction Management features for Form Simplicity was driven by client recommendations. "Form Simplicity was made by Realtors® for Realtors® and was improved upon based on users' feedback," Forsman says. "Form Simplicity truly puts everything in one place that a Broker and agent need to process a paperless transaction from beginning to end." Tom Baker, Regional Sales Manager for The Keyes Company and 2015 Florida Realtors Vice President District 3, who has been beta testing these new features, says, "We are in the process of implementing the Broker Review transaction management platform companywide. We evaluated competitor platforms and made the decision that Form Simplicity was the best solution for transaction management." Among the new features that Broker Transaction Management brings to Form Simplicity is access to the detailed history of each checklist review as well as a fully customizable, color-coded, checklist system that allows Brokers to easily see agent activity by transaction type. The new Broker Review feature allows agents to submit electronically their completed contracts to their broker for final approval. During the digital review process, when brokers or agents add comments, each party is automatically alerted, which expedites the process online. When the broker marks the submission as complete or incomplete, Form Simplicity automatically notifies the agent of the change in status. For easy reference, the review process logs all comments and activities made throughout the workflow. What are the additional costs for Brokers? "Absolutely nothing," says Tricia Stamper, Director of Technology Products at Florida Realtors®. "It's actually better than free, because Brokers gain increased productivity as paperless transaction management makes both the broker and the agent more productive. Plus, there are additional savings from reduced paper copying, both time and the expense, which also makes a positive environmental impact," she adds. Form Simplicity, which is owned by Florida Realtors®, saves agents time with auto-populating smart forms and secure digital signatures; allows agents to share and negotiate transactions with built-in collaboration tools; and provides bank-grade, secured cloud storage of all documents and logs. Used daily by Realtors from Florida to Wyoming, New Jersey to Iowa and Arkansas, Form Simplicity may be used on mobile devices and has an integrated, digital signature solution, speeding up the process of closing transactions. Also included is free tech support provided by the real estate industry's #1 tech support team, Tech Helpline. Tech Helpline is a service owned by Florida Realtors and is known for its friendly, U.S.-based tech analysts. More information about Form Simplicity with Broker Transaction Management is available online at www.formsimplicity.com or by calling 888-784-5404. A video demo is at http://bit.ly/btm-video. Form Simplicity serves the real estate industry by providing real estate professionals with an end-to-end, online real estate transaction solution for expediting real estate transactions that eliminates the need for paper transactions. Form Simplicity gives real estate professionals the tools to create, manage, share and store transactions digitally for on-the-go, paperless transactions. Users have the capability to create and edit transactions on mobile devices. Form Simplicity is currently available nationwide to Realtor® associations, MLS systems and brokerage firms, providing a cost-effective, paperless platform to help real estate agents and brokers integrate their transaction processes through online automation and cloud-based solutions. Tech Helpline, the real estate industry's number one tech support team, supports Form Simplicity. Form Simplicity and Tech Helpline are owned by Florida Realtors® based in Orlando, Fla.
Florida Realtors®, formerly known as the Florida Association of Realtors®, serves as the voice for real estate in Florida. It provides programs, services, continuing education, research and legislative representation to its 140,000 members in 58 boards/associations. 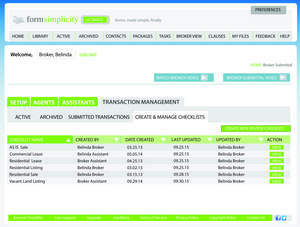 Broker View of Checklists from new Broker Transaction Management inside Form Simplicity. Made by Realtors for Realtors. 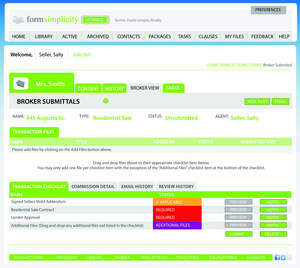 Broker view of Transmittal Forms -- screenshot from inside Form Simplicity. Form Simplicity, has added Broker Transaction Management into its cloud-based platform. Broker Transaction Management creates a single place inside Form Simplicity for real estate brokers to manage, review, approve, track and store every agent's transaction activity from beginning to end.